I'm Not There is glossy and slick: a tribute to Bob Dylan's own slickness in constructing his celebrity identities out of a pastiche of Americana narratives. Todd Haynes's experiment in this compellingly narcotic film reminded me of the semiotics class we took together at Brown, on "Parody and Pastiche." Back then, we discussed Baudrillard and Lyotard, and enthused about postmodern concepts of identity as "construction." The key film for the course was Orson Welles's F for Fake: "which is real? which is fake?" the voice-over asked while the camera zoomed in on a dubious (or was it?) Picasso. How inspiring this class must have been, I thought, to have its precepts executed so exactly in a two-hour plus film, twenty years later. I remembered Todd as the earnest, red-haired student perched forward in his chair, with taut intensity, bright eyes and upraised, nodding chin: the most memorable person in the class. His student film at the time--using Barbie Dolls to reconstruct the Karen Carpenter story (another victim of identity fashioning)--was a creative plunge into the decomposition of traditional narrative, a technique we had all been taught. Now he had taken his interest in American self-fashioning in the celebrity world to another level. Or had he? Our amateur devotion to postmodernism was exciting at the time, but aren't these times achanging? Quite frankly, despite the intrigue, I was bored. Yes, Dylan is not there, but this one-liner did not get me very far. Was there a political or cultural or even philosophical subtext to the not-there-ness--or just a lot of fun with narrative tricks? The narrative tricks were loud and clear: sets that groaned with their own fabrication (fake Western streets, Americana railroad rides); forced shifts from black-and-white to color; the lead singer played by several different actors (pace Luis Buñuel who did the same thirty years ago in That Obscure Object of Desire, and Todd Solondz who revived the trick more meaningfully five years ago in Palindromes). One trick is Haynes's unique trademark: actors who perform like mannered dolls, in costumes and exaggerated hand-gestures, in playful parody of the l960s. The thing is, the theorists who so influenced Haynes--Baudrillard and Lyotard--connected their analysis of the commercial proliferation of images to a critique of capitalism and use value. Haynes connects his playful deconstruction of Dylan to nothing, absolutely nothing. Nor does he develop, as did his predecessors in postmodernism, such as Nabokov and Pynchon, a thought-provoking aesthetics, with truly new considerations of character, time and place. While the set-up of Haynes' narrative is surely inventive, it doesn't lead to any new vision. The only pleasure or interest I took in the film was in Cate Blanchett's superb and gorgeous performance as one of Dylan's alter-egos, and of course in the (too few) songs. The pastiche idea seemed as if it had been on the backburner too long, standing still while America moved on. I asked Todd about his semiotic influence at the press conference in Venice, and he responded with enthusiasm for how important Bob Dylan was as an icon. Yet the film places no value on this importance, and offers no insight into it. We have Americana clichés about family, glamour, travelling, success--and at the end Bob Dylan's own lips on the harmonica, which remind us that, contrary to the film's message, an expressive artist is there. My companion at the screening, a fellow journalist, clapped furiously at the film's finish. "Genius, pure genius!" he exclaimed. Why? "Because Bob Dylan was all construction, and this film shows he was all construction." "Is there anything more to Dylan than that?" I responded, unconvinced by the payoff. "No," my companion said. "He was a huckster." Take away this idea of the huckster--this depoliticized echo of theories bandied loosely on a college campus--and it's hard to see what this film offers except a series of glamour shots and insular concepts about what it means to be American, as well as reductions of the1960s (war included) to "image"? This emptiness is unfortunate, partly because there's more to Dylan than that,* but also because Haynes's previous films--such as Safe and Far From Heaven--used postmodern ideas to much better effect. Those films gave their subjects worth and poignancy, and had impressive aesthetics beyond their self-referentiality. 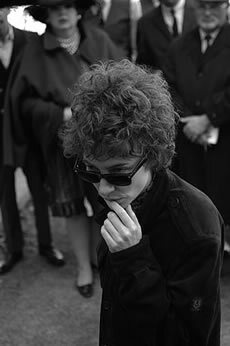 *In a recent interview on the Huffington Post, Haynes notes that "of course [he] could have asked to meet with or talk to Bob Dylan," but he "never needed to do so to make the film." For Dylan fans who find Haynes's film a profound, fresh look at their hero, this fact should be revealing. Is Dylan not there, or does Todd not want him to be there?